One of the most interesting and creative things I do is to collaborate with other vendors. When the opportunity comes up to work with blogger extraordinaire Mandy Kellogg Rye I literally jump at it!!! She has an eye for design that allows all the vendors to look their best.. sometimes to look better than they have ever looked! This collaboration was to show table setting correctly for any event. 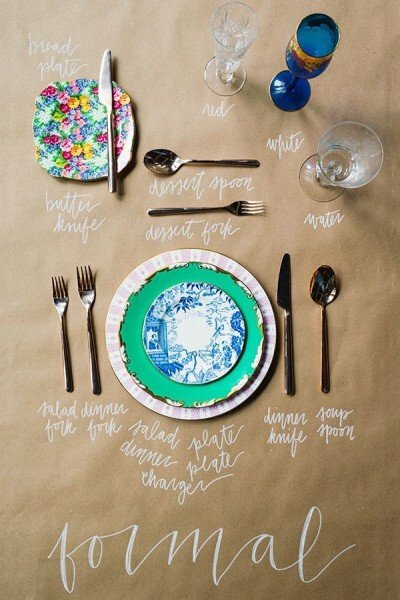 Creating a table setting can at first seem daunting here we make it simple. A formal but modern setting should include a Dinner Plate,usually this is a minimum of 10 inches across but can be as large as 11 1/2 for some styles.A salad plate about 8 inches across is more than adequate here. A bread plate usually around 6 inches although I have some that are 7inches others as petite as 4 1/2 aah the joy of vintage!! The bread plate can be layered as shown or placed in upper left of the setting as preferred either is correct.The flatware is often a conundrum, which fork to use!! This is really quite simple start from the outside and work your way in with each course.The dessert utensils will be above the plates ready for scrumptious puddings! Glassware is rarely complicated, water is often the largest glass, sometimes a tumbler and is less fancy than those used for wines. White wine is served with fish or dessert and red with meats. 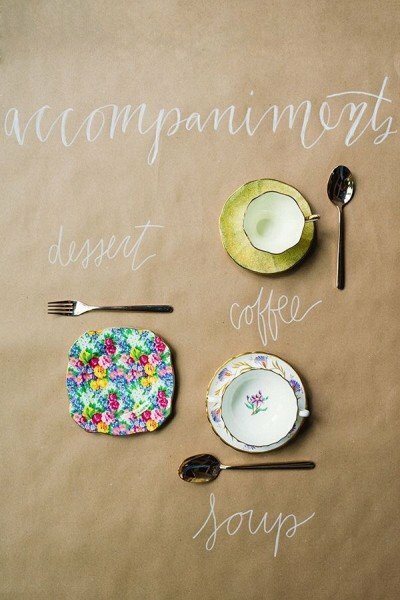 Our Informal table setting is simple and elegant, as only fine china can be. 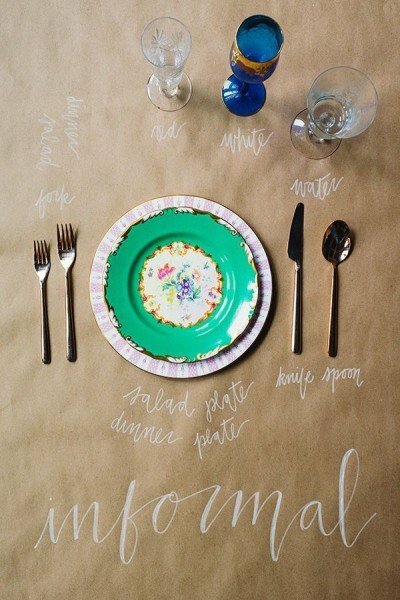 A dinner and salad plate are laid upon one another for serious wow factor! Special extras include a double handled soup bowl seriously cute and always a talking point at the start of dinner when laid upon a large saucer.a dessert plate or bowl can be an added piece of pizzazz at the end of a satisfactory meal or these plates can be used for a delicious cheese and fruit course.Finally the coffee or tea,served in divine vintage fine china what could be a better end to a perfect evening? All images from Rustic White, Calligraphy from Jamie Jiminez, styling Waiting On Martha as published on her blog and on The Celebration Society.